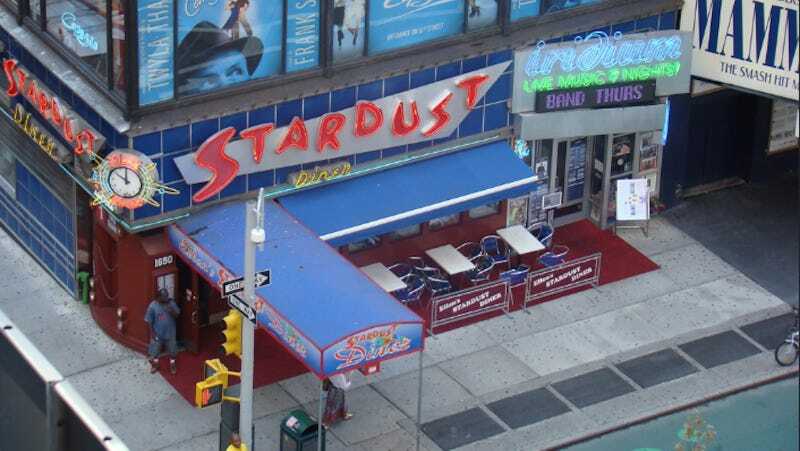 Ellen’s Stardust Diner caters to tourists in Times Square who want to eat expensive fries and have servers climb up on the back of their booths to sing Broadway standards. It is a little slice of family-owned cheesery in a place that is becoming increasingly sanitized and corporatized, but lately even Ellen’s is feeling the changes. What happened instead, the workers said, was a mass firing of longtime servers, many for small offenses or ones seemingly beyond their control. Last week, for example, a waitress was fired when a table of customers left without paying, Ms. Bogan and others said. Servers at Ellen’s are known as Stardusters, and their head shots grace the diner’s walls and website like celebrities in a playbill. But behind the scenes, workers said, the new managers warned them that they were easily replaceable. One thing is certain: Times Square was, is, and will always be a toilet.